Mount Shasta presides over the view from the summit of Mount Eddy. By any standard, Mount Shasta is a great destination for hiking trails. Whether hiking the timberline trails on the mountain itself, the alpine tracks that wind through the neighboring Trinity Divide or the refreshing paths that follow the Sacramento and McCloud Rivers, hikers are sure to find spectacular scenery. However, for those looking to enjoy the hikes around Mount Shasta, there is a bit of a quandary. The region’s unique geography means that those in Mount Shasta City are at the epicenter of a great trails system and a short drive in any direction will bring hikers to excellent trails. 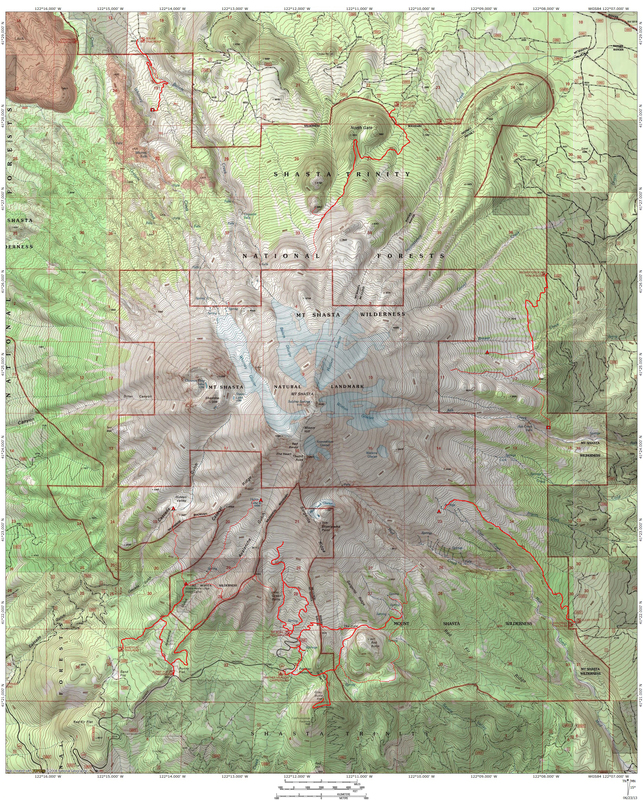 Mount Shasta lies to the east, the Trinity Divide lies to the west, the high desert trails of the Shasta Valley are to the north and the rivers are hidden away in canyons south (OK, southeast for the McCloud) of town. Hikers in McCloud, Dunsmuir and Weed, though not in the center of the ring, are all still only minutes away from fantastic hikes as well. Wherever one lives in the Mount Shasta area, there is a cornucopia of excellent trails to hike. On the other hand, for those visiting Mount Shasta, it can be difficult to decide which trails to hike. For many travelers, it is important to strike a balance between being active, getting the most out of the activity, and yet still finding time to relax and enjoy themselves. Any time spent around Mount Shasta is worthwhile but to really experience the variety of the area three full days is probably the ideal minimum. This would allow for three hikes at a leisurely pace through three of the areas very different environments. This would also allow for plenty of relaxation in between stints on the trail. 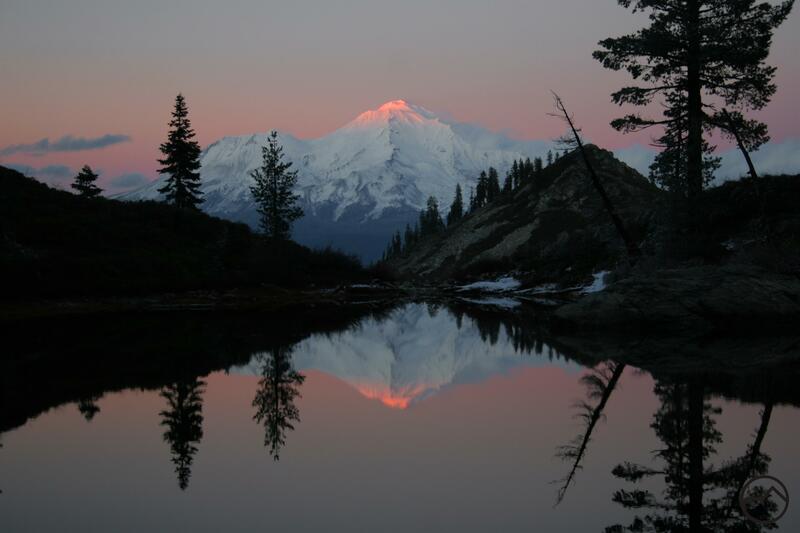 Although there are many great trails to hike, there are three that standout that, when combined over three days, provide the best opportunity to appreciate the incredible beauty and variety of the Mount Shasta area. These trails, the Deadfall Lakes Trail, McCloud River Falls Trail and the South Gate Meadow Trail on Mount Shasta are welcome repeats for regular visitors and a terrific orientation to the region for newcomers. More importantly, they provide some of the best scenery and vistas to be found anywhere in Northern California. The Deadfall Lakes from Mount Eddy. At the beginning of any endeavor it is important to orient oneself with the task at hand. 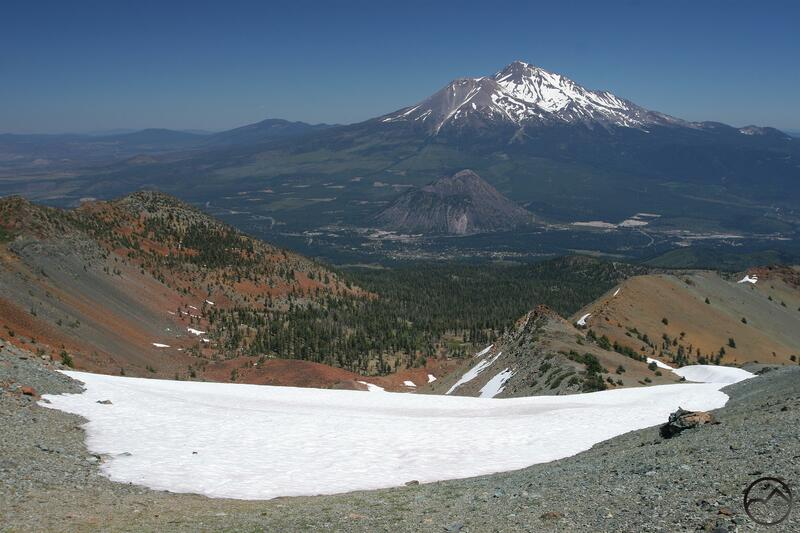 When it comes to hiking around Mount Shasta, there is no better way to do this than climbing to the top of Mount Eddy. The second highest peak in the region (excluding Shastina and a few other subordinate peaks on Mount Shasta itself), the view from the summit of Mount Eddy is unparalleled. Stretching from just south of Lassen Peak to deep into southern Oregon, the vista from the top of Eddy takes in most of the North State’s most prominent landmarks including the entirety of the Trinity Divide, the Yolla Bolly Mountains, the Bully Choop area, the Trinity Alps, Russian Wilderness, Marble Mountains, the Siskiyou Wilderness, the Red Buttes, and the northernmost section of the California Cascades topped by the Goosenest. The Shasta Valley sprawls to the north, leading the eye to a host of southern Oregon landmarks including Pilot Rock, Mount McLoughlin, many of the rounded peaks of the Sky Lakes Wilderness, the ancient caldera of the Mountain Lakes Wilderness and even the rim of Crater Lake, far to the north. Of course, the looming mass of Mount Shasta dominates the view. It is a dizzying spectacle and sure to give anyone new to the area a strong sense of what is where. The stunning vista is not the only highlight of the Mount Eddy ascent. The trail to the top of the peak is tremendously scenic. Lush meadows with explosive wildflower displays, technicolor cliffs that range from orange to russet and the icy, alpine Deadfall Lakes are all featured prominently along the trail. Not only do these highlights along the trail enhance the scenery, they are also a great introduction to the unusual geology of the Trinity Divide. After making the ascent to the summit of Mound Eddy, legs may be a little stiff so an easier hike on the second day is in order. This is a great opportunity to take a leisurely stroll along the McCloud River Falls Trail. 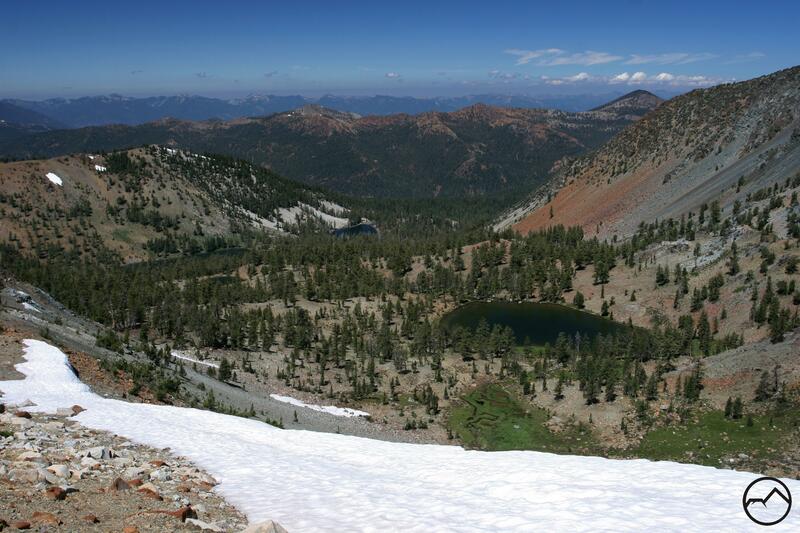 This is one of the most popular hike in the Mount Shasta area and for good reasons. With the exception of one short, switchbacked climb near the middle of the hike, it is almost entirely level. However, an easy trail does not mean that it is slacking in terms of scenery. The trail parallels the McCloud River for its entire length. The river is swift moving and wild, carving a deep and scenic canyon through lava flows and layers of ancient tuff. As the name suggests, the river’s waterfalls are the real highlight of the hike. The McCloud pours of a trio impressive cataracts, each different from the others. The first, near the trailhead is the simplest. The river shoots over a hardened basalt lip and drops 10 feet into a deep pool. The second waterfall, in contrast, is one of the better waterfalls in Northern California. 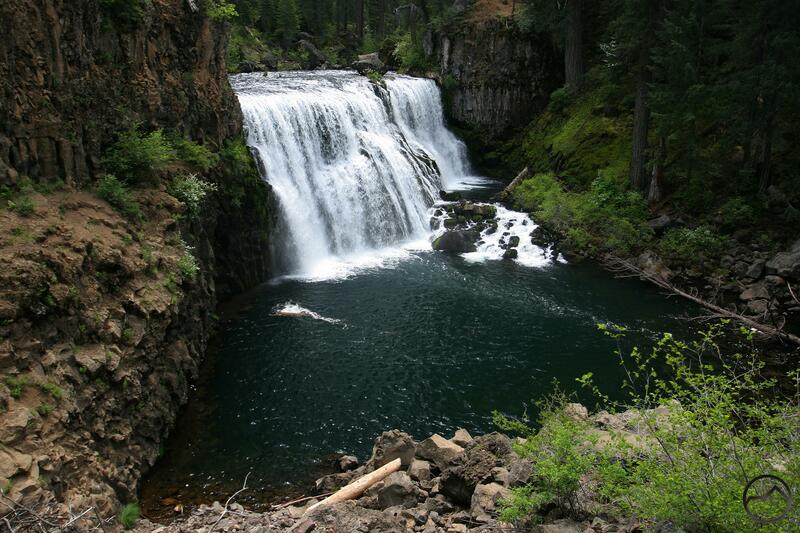 Tall and wide, Middle McCloud Falls is a blocky, rectangular drop about 50 feet high and nearly 100 feet across. It is an impressive sight and the roar of the river plunging over the precipice is nearly overpowering. The third and final waterfall is the most unique. Upper McCloud Falls shoots through a rocky gorge as it cuts through a deep basalt layer before it rockets over the edge carved into a cliff, plunging into another deep pool. There is a fantastic picnic area just above the Upper Falls and this makes a great turn around point. For those looking to hike a little more, the McCloud River Trail continues over 10 miles to the east. The next segment after the Upper Falls is among the best and makes a great add-on to the falls hike. Follow the river to the small, concrete Lakin Dam and the bayou-like marsh behind it. There is a nice little picnic area near the dam. While hikers can expect to have company on the falls trail, this area is practically abandoned and solitude come in abundance. The McCloud River Falls Trail is not necessarily an all-day affair and heading back to basecamp for some relaxation is certainly a great option. However, if hikers are more ambitious and like to maximize time on the trail, the Heart Lake Trail is a great afternoon or evening option. It is an easy drive up to the trailhead at Castle Lake, which is a worthwhile outing in its own right. From there it is only a quick but fantastically scenic hike up to tiny Heart Lake. What the diminutive tarn lacks in stature is more than makes up for in epic view. The small lake has a perfectly framed view of Mount Shasta and makes a phenomenal place to sit and watch the sunset reflect on the towering heights of California’s mightiest mountain. If the view from Heart Lake is not grand enough, an even more expansive vista can be had by climbing to the peak behind the lake. From the summit it is possible to take in much of the Mount Shasta area, including a staggering view of the rarely seen back side of the Castle Crags. The hike back down to Castle Lake is short enough that quick hikers can complete the trip in the twilight, before darkness take hold. Otherwise, be sure to bring a headlamp. No trip to Mount Shasta is complete without a hike on the mountain itself. Of course, the best trails are not always an open to hiking, especially when the road from Bunny Flat up to the Old Ski Bowl is not open. Typically this section of the Everitt Memorial Highway is not opened until July 1st so it is not uncommon for hikes in this area to be inaccessible. If the road is open then the best hiking option on Mount Shasta is the trail to South Gate Meadows. Everything about this trail is fantastic. It has tremendous variety, it can be done as a reverse lollipop, it is fairly easy, spectacularly scenic, has excellent vistas and offers plenty of opportunity for exploration, including a chance to peer into gargantuan Mud Creek Canyon. The trail climbs through a gorgeous old growth red fir forest en route to the barren flats of the Valley of the Moon. Beyond the valley, which lies at the foot of imposing Red Butte, the trail passes through the narrow gap of South Gap. On the far side of the pass hikers only have a short distance to hike before arriving at verdant South Gate Meadows. 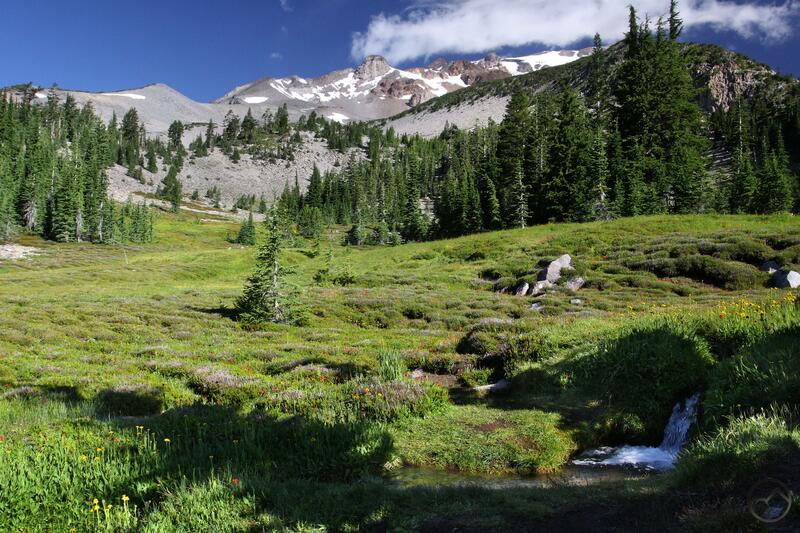 This lush alpine garden is one of the prettiest and most serene spots on Mount Shasta. Fountains erupt surprisingly from the grasses and wildflowers grow in profusion. Behind it all rise the craggy towers of Sargents Ridge, including awesome Shastarama Point and needle-like Thumb Rock. The Konwakiton Glacier clings to the highest reaches of Mount Shasta. It is possible to hike all the way up to the springs from which spring icy streams that course through the meadow. The hike up to the source is highlighted by a tall cascade which separates the lower meadow from the upper section. For those looking to head off to the rim of Mud Creek Canyon, the cascade is near the spot where one will need to head off trail. On the return trip, the path splits just after passage through South Gate. Rather than heading back the same way, it is possible to head to the right, hike up delicate Hummingbird Meadow to a high pass with awesome views. From there, the trail drops down into the Old Ski Bowl with great views of the Trinity Divide and Trinity Alps almost every step of the way. Once at the Old Ski Bowl parking area, a use trail leads down to lush Panther Meadow and the trailhead, ending a truly spectacular hike. Since hikers will already be up on the mountain, it is worth packing a picnic dinner or some snacks. Head back up to the Old Ski Bowl and enjoy a stunning sunset from the tables that scattered around the area. The views are epic and the landscape is gorgeous. It is the perfect end to three action-packed days in Mount Shasta. Beautiful shot from Heart Lake! Just like those stories in Hemispheres magazines, only way better and less touristy. Would the trails be accessible this time of year? I’m prepared for snow hiking/camping if the trails are open! All the high trails are covered in snow. Everything down around town or along the rivers is accessible.